Blood pressure tends to increase with age. Therefore, hypertension is exceedingly common in the elderly. Different blood pressure goals for elderly patients used by different physicians. Hypertension is associated with significant burden of health and an increased risk of heart disease, stroke, decreased quality of life and death in elderly. Despite the common phenomenon of hypertension in elderly, we generally do not know much of what is the ideal treatment goal for elderly as many researches in the past has not included older population. The effect of this arterial aging (eg. arteriosclerosis) causes a condition known as isolated systolic hypertension, which accounts for 87% of hypertension cases in elderly. 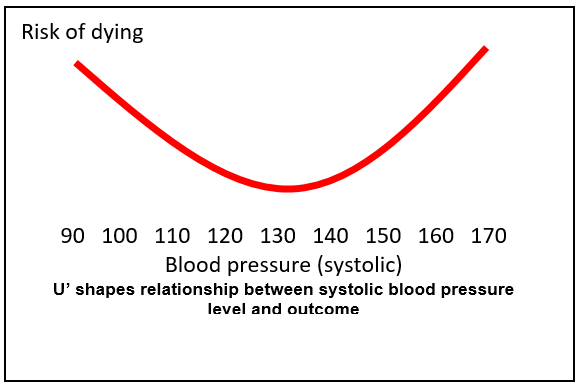 Isolated systolic hypertension happens when systolic BP is greater or equal to 140mmHg with diastolic BP less than 90mmHg. Aggressively lowering the blood pressure, however, may also cause a situation where blood supply to the vital organs gets interrupted. Therefore, lowering blood pressure too much may result in bad outcome as well. 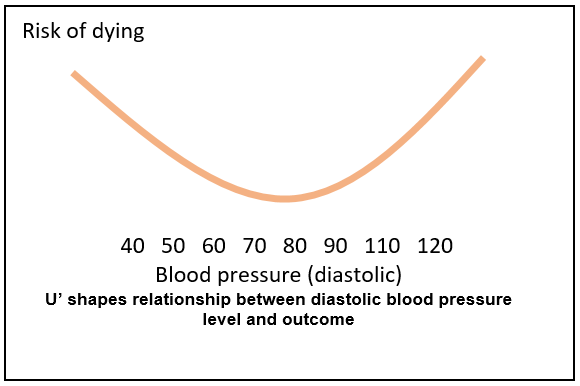 U shape relationship between blood pressure level and outcomes means bad outcomes can occurs when blood pressure level is at both extreme: either too high or too low. Therefore, it is important to determine the best target of blood pressure control for each individual base on the evidence we have from research. The targets suggested above are for fit elderly. Sometimes, the target may not be reached due to severe orthostatic hypotension. In that case, the lowest tolerated blood pressure should be chosen as the target. Over aggressive blood pressure reduce blood supply to the brain. This may worsened the already impaired blood pressure regulation ability in elderly. Lifestyle and diet modifications should be recommended to all patients with hypertension. Home blood pressure monitoring is important in diagnosis of hypertension in elderly due to the presence of possibility of white-coat hypertension (hyperlink to white-coat hypertension). Clinic follow ups with regular blood check is essential for elderly taking blood pressure medication. Treatment of hypertension should not be self administered without guidance and surveillance from the professionals. Hypertension in elderly is common and treatment is needed. Diagnosis and treatment is more challenging in elderly compare to the young. Lifestyle and diet modification should be advocated in all hypertensive elderly. If medication is needed, it should be started at the lowest dose and dose adjusted gradually. For elderly below age of 80 years old, systolic blood pressure target should be below 140mmHg. For elderly equal or older than 80 years old, systolic blood pressure target should be 140-150mmHg. For frail elderly or elderly suffering from orthostatic hypotension, a higher blood pressure target may be selected. The blood pressure target for this fragile group of elderly should be customized. Beckett NS, Peters R, Fletcher AE, et al; HYVET Study Group. Treatment of hypertension in patients 80 years of age or older. N Engl J Med. 2008;358(18):1887–1898.